1st step is to bring up the ropes and fix all security systems for the team, 50 meters above ground! 2nd step is to prepare the tree for our honeyhunter "Jacob"! 3rd step, the team gets up the tree with equipment! Jacob climbed the tree without savety rope and with almost no protection clothes! Even with this very hot suites we got up to 50 stings per day! After a hard day fixing ropes, recording sounds and assist the cameraman! 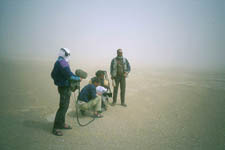 Not only camels wondered what we did in central sahara, pictures from Tsachad 2000! We also wondered about overbooked "Tschadtours" and went to Brasil, Peru and Ecuador, where the transport system wasn«t much better! Beautifull locations, axel and his mascot, scenes with many extras, discussiones with actors or hangig out! To get good sounds, you sometimes have to get nearer than you want! Religious festivities, washing diamonds and tragedies like "Goma refugee camp" happen side by side, scenes from Zaire and Ethiopia 1994! Sunken ships, dependants of blood revenge and broken monuments, scenes from Albania in 1993! Men going out for fishing in their dugouts, children prepairing for theater and a visitor on his ancestores graves, scenes from Newguinea 1997! 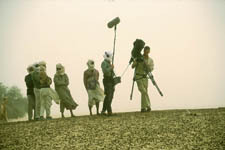 Waiting goods, our orphant Pema, The crew and me in Dolpo (Nepal) in 1993! Forbidden things, shooting on austrians highest mountain, freeclimbing, get ready for the beetree, replace the austrian border, opperate a movecrane or repairing filmequipment on set, juggling with coconuts to keep curious people away from the camerateam, or celebrate the end of shooting, you can count on me!